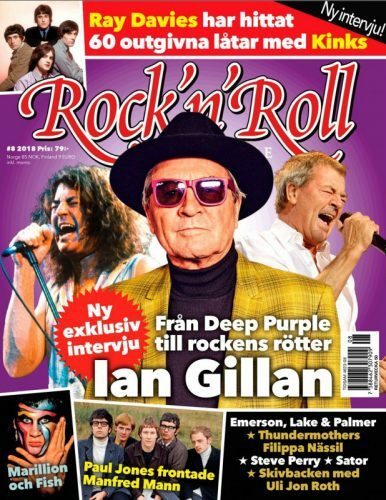 The latest issue (#8-2018) of the Swedish Rock’n’Roll magazine has a 12-page feature on Ian Gillan with lots of pictures. Chuck Berry needed a backing band for a gig in 1970, for which Deep Purple helped him out. The band went on stage without knowing the setlist. Gillan once had a chance to meet his hero Elvis Presley, but was so intimidated that he didn’t go. The rest of the band went, and apparently Elvis was very courteous. Big Ian regrets his decision to stay back to this day. He also retells the “spaghetti incident” story. The magazine can be purchased through their online shop (caveat, it’s naturally all in Swedish). Speaking of spaghetti, issue #6 earlier this year had His Blackness on the cover with another feature inside. Posted by Nick Soveiko on Saturday, November 10th, 2018, filed under News. You can follow comment on this post through the RSS 2.0 feed. You can skip to the end and leave a comment. Pinging is currently not allowed. I am the GODFATHER. LOL!!!!!!! !